I’ve played a little bit with fancier transfer functions that the ones for my classic compressors and expanders. 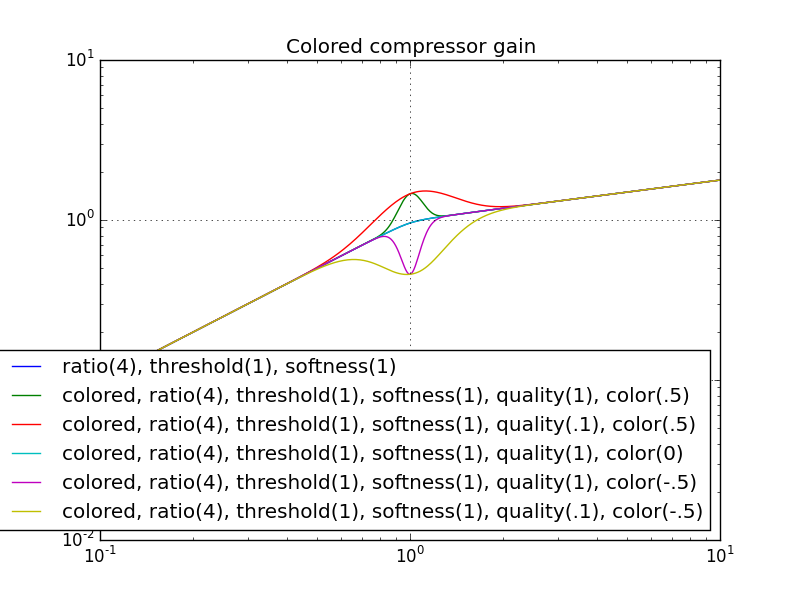 A colored compressor or expander has a similar asymptotic behavior than an uncolored one. So the main difference in behavior is near the knee. 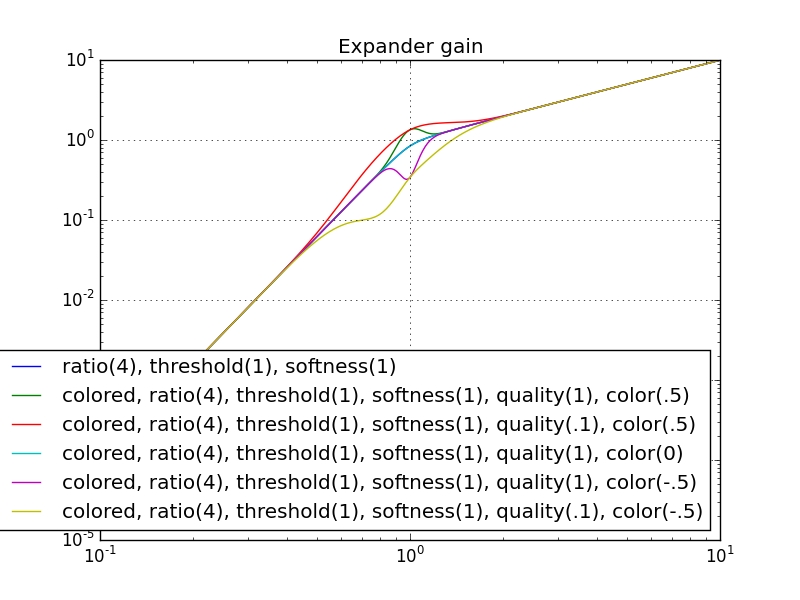 In this case, I’ve decided that the color will be an additional Gaussian centered around the threshold. The quality would be its standard deviation and the color the size of the Gaussian. 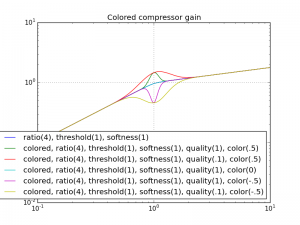 Of course, a color of 0 returns the transfer function to the old one, but now it is also possible to add quirks that would make the gain non monotonous, so creating the said color to a compressor or an expander. The auto swell filter is, as far as I understood, also a filter working on a gain transfer function. 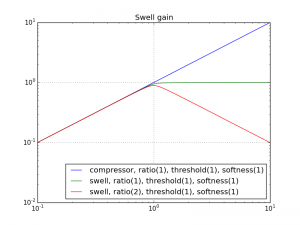 A compressor cannot lower the volume below the threshold, but an auto-swell can. The higher the volume, the lower it gets. 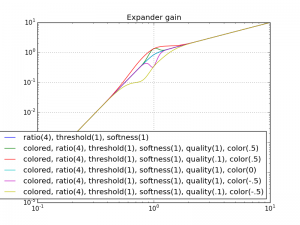 So up to the threshold, everything is similar, but as soon as the volume gets higher, the gain is lowered by the ratio times the added volume. By working with an attack release filter to drive the gain, the final effect can be quite strange, with a big attack followed by a harsh volume reduction, ending with a smooth increase of the volume (medium speed attack, high ratio and slow release). With these new transfer function, I’m not sure there is anything missing in the Dynamic module of Audio Toolkit. as such, once the plugins are implemented (mono, stereo and side chains), I will surely try different things.